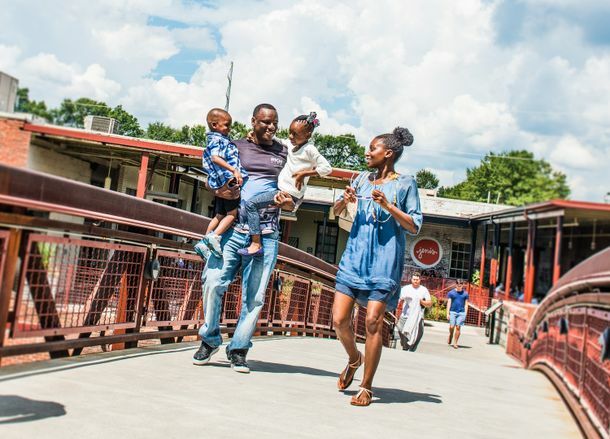 Atlanta’s Westside is the city’s former meatpacking district-turned-design hub. This neighborhood now offers eclectic clothing, designer furniture and other specialty shops housed in industrial warehouse spaces. Breakfast: Start the day at West Egg Café, voted best breakfast in Georgia by Southern Living. Chow down on the Westside Pileup which includes skillet potatoes, onions, peppers, cheddar cheese, bacon and eggs. Morning: Stroll through the ruins of a cotton gin-turned-visual and performing arts center. Home to a renaissance community of artists, Goat Farm Arts Center now hosts classical and contemporary music concerts, film screenings, contemporary dance performances and visual art exhibitions. Lunch: Grab lunch at Bocado, a contemporary eatery serving American cuisine in a trendy minimalist atmosphere. Though the menu changes regularly, locals count on the famed Bocado burger stack – two 3 oz. patties between two slices of Kraft American cheese with house made mayo and pickles on a Holeman and Finch sesame bun – which is considered one of the best burgers in Atlanta. Afternoon: Explore Westside Provisions District for stylish finds in clothing and design. Atlanta MADE offers locally-made furniture, housewares, organic skin care products and more. Mixing wardrobe staples with bold accessories, local-owned Ann Mashburn is a one-stop shop for the well-dressed woman. Pick up the latest styles at Sid Mashburn, the men’s counterpart to Ann, dedicated to the high-quality, specialty clothing for today’s stylish man. Take home gourmet goods from Preserving Place, a unique “farm to store” retail concept offering cooking classes, specialty cooking supplies and house-produced preserved food. Dinner: Cooks & Soldiers is a Basque-inspired restaurant serving traditional pintxos (Spanish-style snacks) and raciones (Spanish entrée-style dishes). Try the whole grilled fish or “Chuleton,” a large grilled rib steak cooked on an asador, or wood-fire grill. Night: Dance the night away with national touring acts at Terminal West. Housed in King Plow Arts Center, Terminal West boasts hip crowds, high-tech lighting and sound and an outdoor roof deck overlooking the historic train tracks of West Midtown. Visit www.atlanta.net/explore/neighborhoods/westside to learn more about the Westside.